Locks Truck & Car Racks from Proline: Thule Racks, Yakima Ski Racks, Bike Racks Canoe and Kayak Racks Cargo Carriers and Truck accessories. Thule lock cylinders fit all thule products. 544, 596,512 or 588. 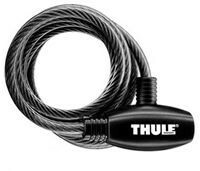 Thule 955 No Sway Cages for hitch bike racks. Master Lock Quantum Bike Cable Lock 8126D Bike Cable Lock.